There are pristine places in the world still untouched by human pollution. Water so clean you can view the land formation under the water...from above it. This is Menorca, Spain. Vacation Type : This trip is hard to categorize due to it’s dynamic variety. 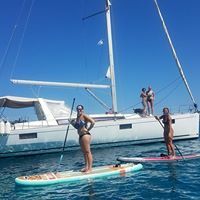 Barcelona is filled with touring, shopping and dining while Menorca is filled with beach days, sunset VIP cabanas, sail boat cruises and more. Activity wise our Spain trip is mellow. However we still do and see quite a bit! Paddling: We do two paddle tours on Menorca island which are going to take you to some of the most dramatic seascapes you’ll ever see! You’ll paddle into stunning coves with turquoise waters so clear you can see 50 feet down to the bottom. After snorkeling and swimming you’ll continue into breathtaking caves 300 feet high. The photo’s below show you everything you need to know! Expected Paddle Distances: 1.5 to 2.5 miles broken up with relaxation, swimming and snorkeling. Deposit - $500, Balance due June 30, 2019. If you need more time just let us know. We'll find a way for you to get to paradise! Located just a short walk from the iconic neighborhoods El Born and the Gothic Quarter, the Yurbban Trafalger hotel in Barcelona features an upscale design with the charm of a local villa. Throughout the hotel you will find locally designed art that gives you a sense of "living like a native". Attention to detail is around every corner from the layout of the traditional Catalan breakfast to the handmade plush toy set in your room. Whether you are taking in the sights from their rooftop pool or enjoying the use of their free bikes though the city, one night in this oasis and your senses will be on happiness overload. After three days of taking in the sites in the big city, our arrival on the quaint island of Menorca delivers a feeling of peace and ease. 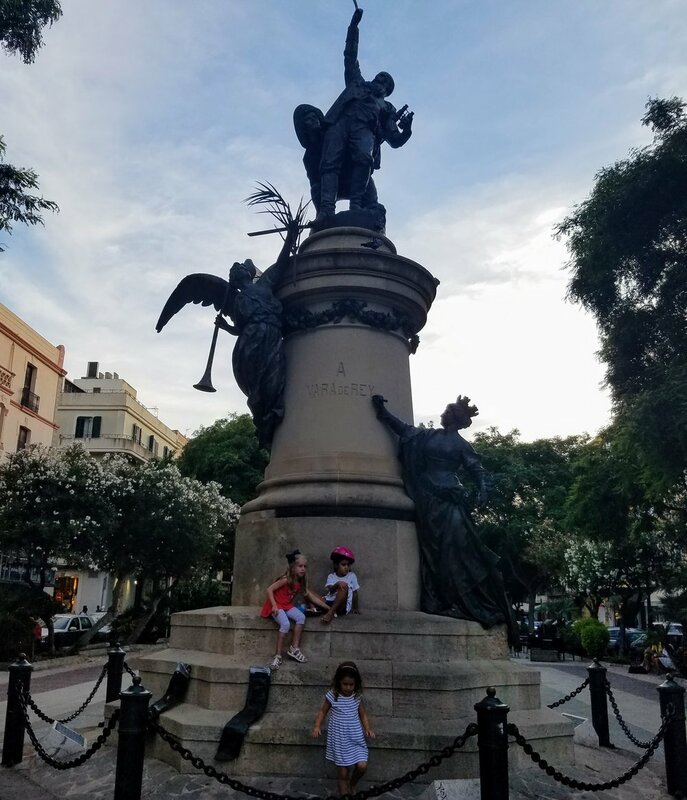 Down a little street, just two minutes from the town square, you'll find Hotel San Miguel. With only 12 rooms and 3 staff on site, this Spanish getaway makes you feel as if you were staying in the welcoming arms of local friends. But don't let it's size fool you. The quality and service is exceptional. Each room adorned with plush beds, spacious bathrooms, spa tubs and a design that exudes comfort. Relaxation and rejuvenation are guaranteed at our home for the week in Hotel San Miguel. Recently rated 8th best city in the world to visit by Travel & Leisure, Barcelona is a city that has it all. Full of historic sites, beautiful architecture, world class dining and amazing beaches. 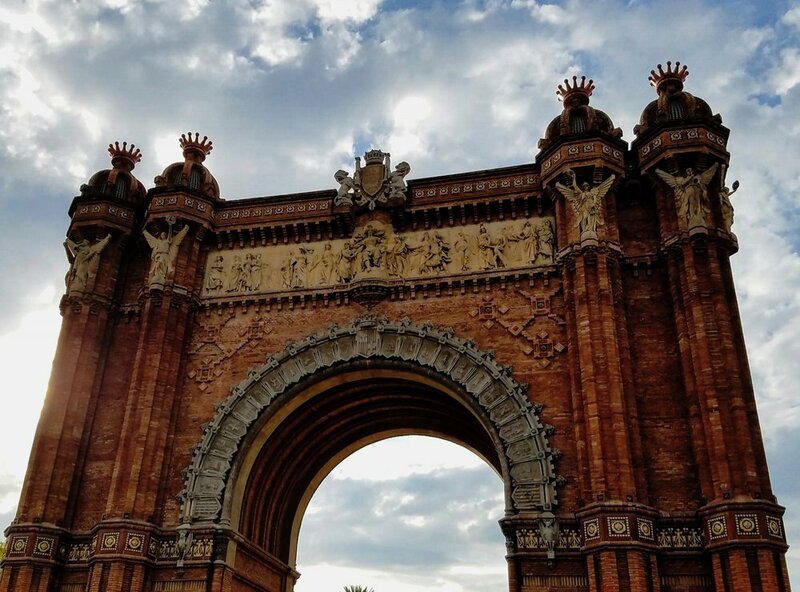 It's easy to see why Barcelona is at the top of many peoples bucket list. Now is the time to check this one off of yours! Just a short one hour flight from Barcelona is the beautiful island of Menorca. One of four islands in Balearic island chain, Menorca is an outdoor lovers paradise and has been named a UNESCO Biosphere Reserve. Smaller than it's more populated neighbors Ibiza and Majorca, Menorca maintains a quieter pace of life. One that is ideal for our vacation there. Less traffic, less people, more relaxation. While all the islands are beautiful in their own right, we prefer our town squares, restaurants, beaches and walkways free of mass tourism. You get a truer feel of the land and the culture this way. You can stroll in peace while you window shop through local boutiques. Find a spot on the sand without crowding. 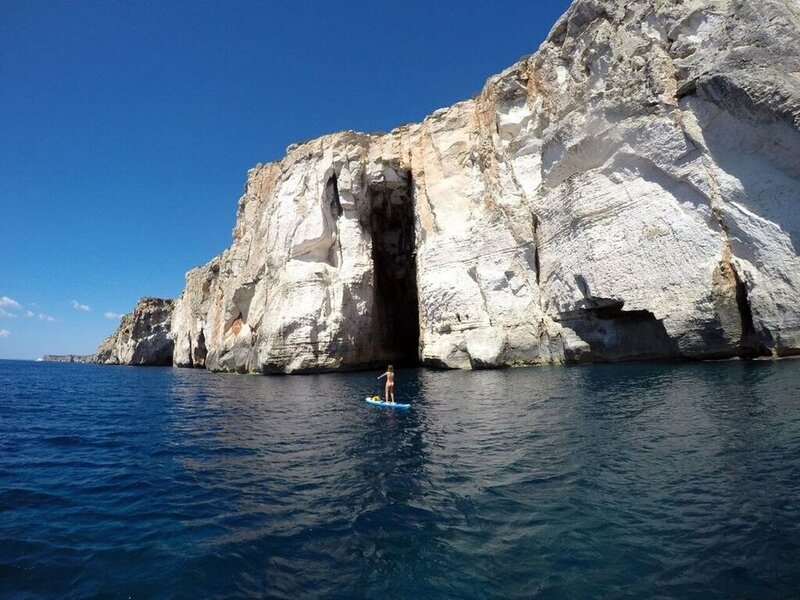 Stand up paddle in caves and coves with absolutely no one else around. Menorca is a Spanish dream land and we can't wait to share it with you! Unique and diverse best describe the activities in Spain. This trip is special in that sense. It's a cultural adventure vacation! 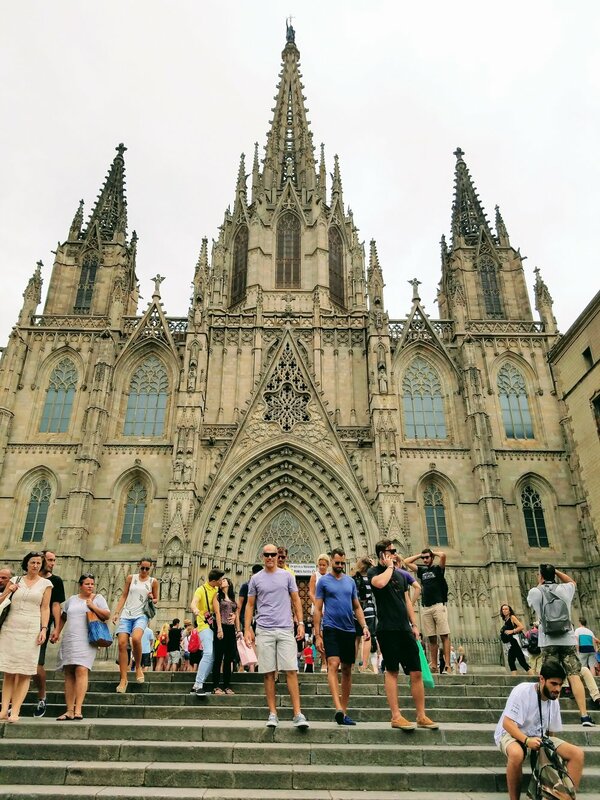 In just 10 days you will experience world famous cathedrals and architecture, stroll down grand promenades such as Las Ramblas and the Arc De Triumph, sunbath on pristine beaches, stand up paddle in turquoise water and of course dine in heaven! And that is just the beginning of it all. We have charted a private sail boat to live like royalty for the day in Menorca. And to cap off your trip we will immerse you in local culture with an evening at the grand celebration of the town of Mahon. This 4 day event called Festes de Gracia is an experience unlike anything you have ever seen. We will be a part of the kick off celebration where hordes of locals sing and dance in the streets followed by a beautiful parade of black stallions in the town square. All of this and it doesn't even begin to describe all of the sights, sounds, smells, people and beauty you will absorb while in Spain. Get ready to be amazed. As always, it is your vacation. You can join it all or do as you like. We'll see you in the plaza for dinner! Festes de Gracia Celebration & Parade of Horses In Mahon. An experience unlike no other!!! 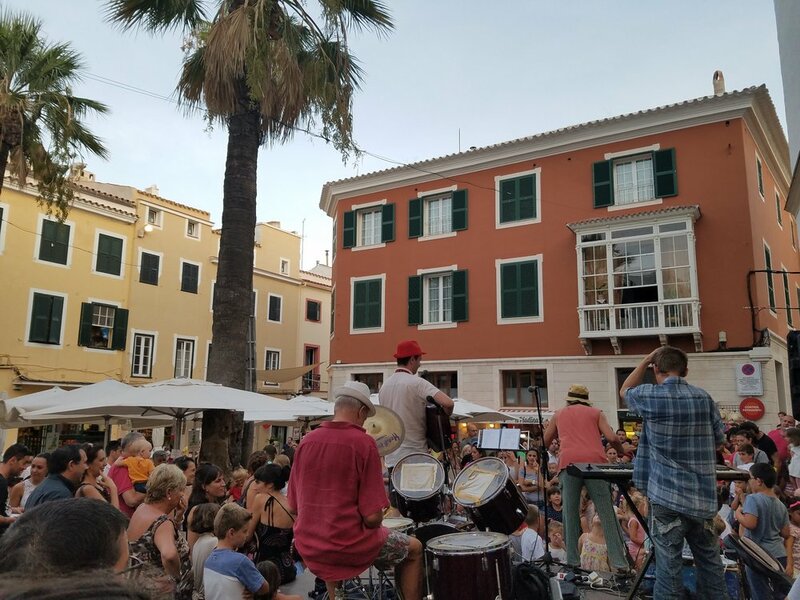 Live Music Dinner By The Water at Namaste in Beautiful Cales Fonts. There is so much more to your vacation that we can't even list it all. 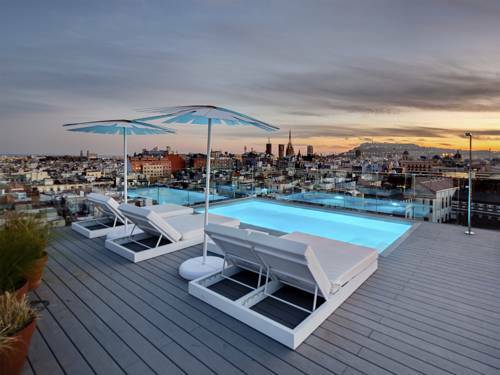 Time to relax at the rooftop pool in Barcelona, shop down cobblestone streets, snack on delicious tapas. It goes on and on! This is your vacation! You can choose to participate in everything or nothing at all. Do whatever fulfills your soul. We'll meet see you at dinner! Flights can be included in your trip should you not have airline miles to use. Average flights from San Francisco are $700 and we have seen them as low as $540. Flights from New York are roughly $550 and go as low as $400. The sooner you are ready to purchase, the better your chance at getting a great deal. We are happy to take care of your flight plans from any international airport for you. Simply select the "With Flight" option when securing your reservation with your deposit. We will get you on the most direct flight at the cheapest option available. It is our mission to ensure a vacation with Flow is always care free and easy. Please send us a message via the contact page with any questions and we will be sure to take care of all your needs. **Flights purchased by Flow for you are payable direct to Flow at the time of purchase. Do we even need to say it? 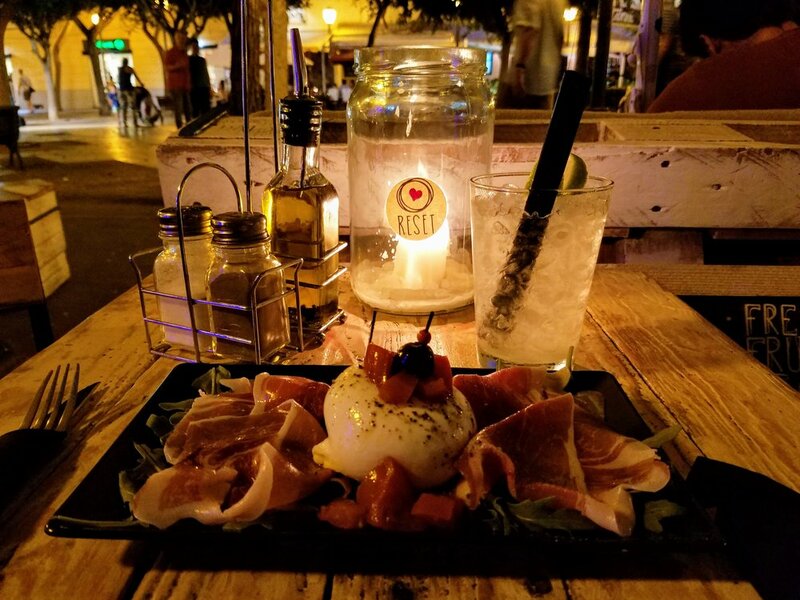 Spain is dining heaven! 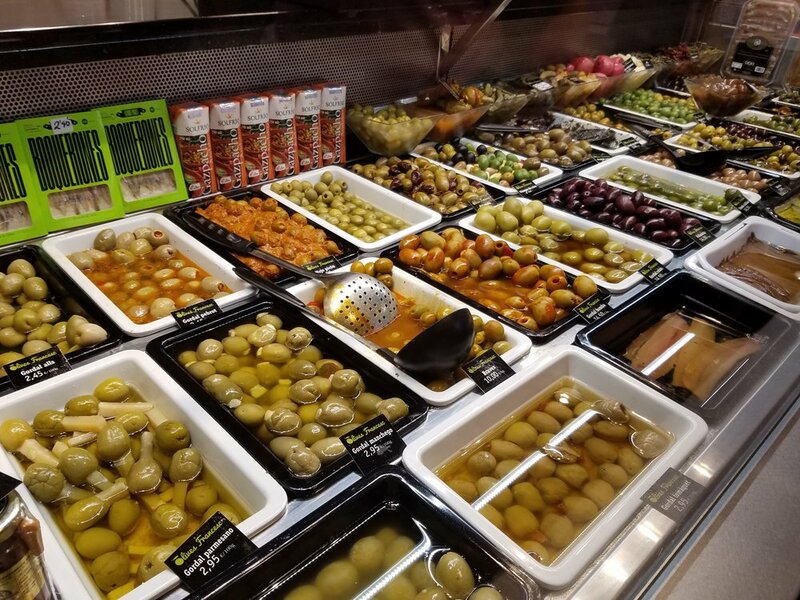 Around every corner is culinary bliss and it is an essential part of the Spanish experience. 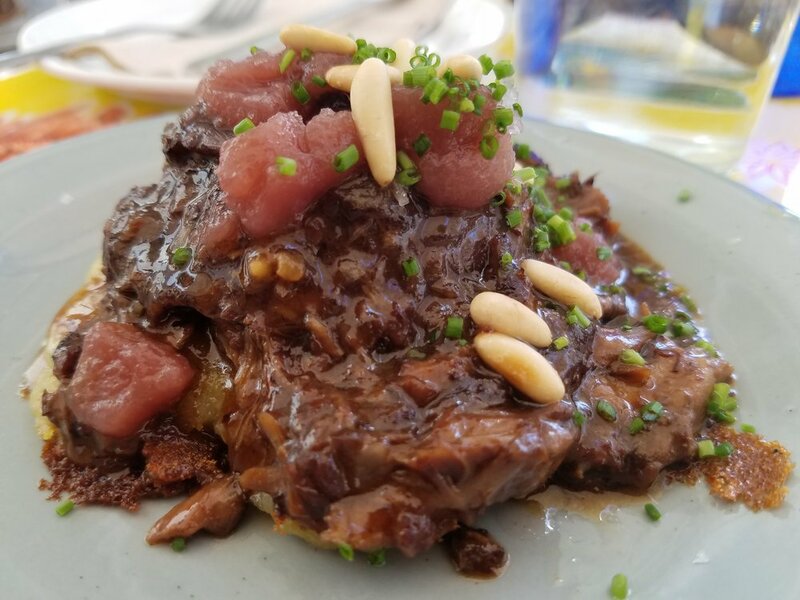 Dining with the gods is guaranteed but it is more than that in Spain. It is a way of life. 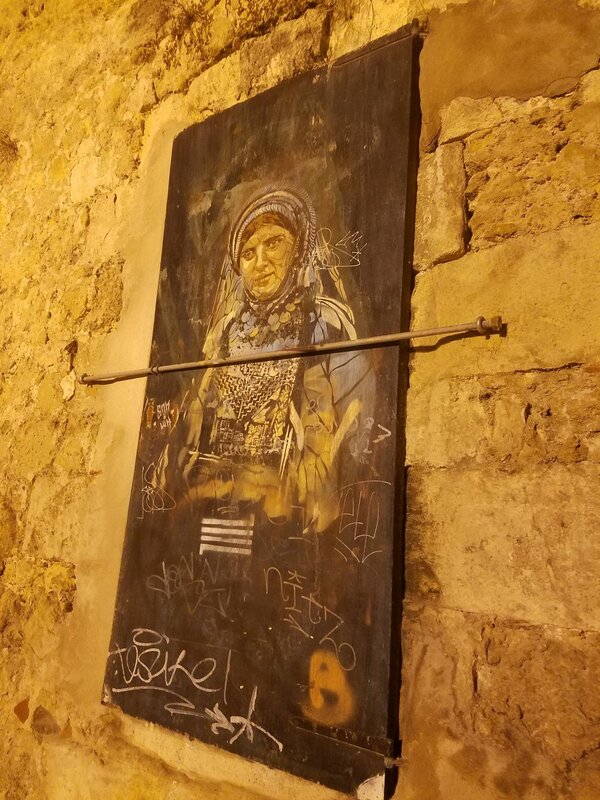 One that may take a few days to get use to but then suddenly you are sitting in a beautiful town square at 10 pm listening to a local strum the sounds of Catalan and laughing with your friends. Suddenly it all makes sense. Maybe we have it all wrong and this is how life should be! Don't worry. Siesta from 2 to 4 is also a way of life here. 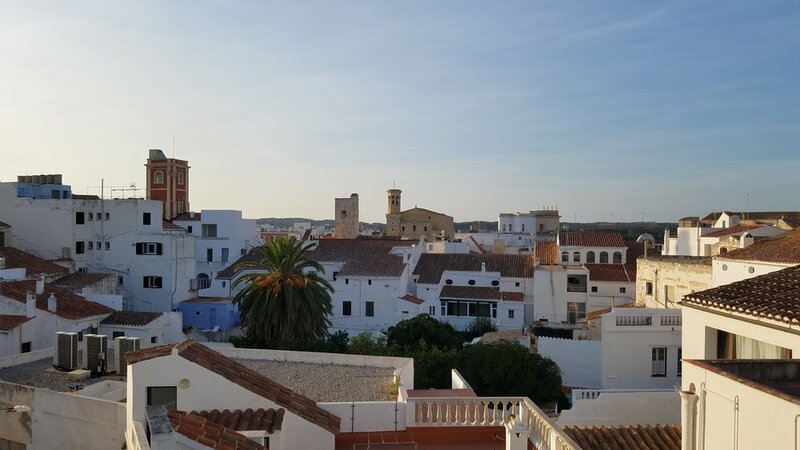 Given the vast array of dining options, we have not added the cost of an inclusive dining plan to this trip however breakfast is included during our stay in Menorca. Part of dining in Spain is learning where and how to do it without spending a fortune. For example inclusive breakfast in most hotels will cost you around $20 a day. Take a morning walk outside of your hotel to a local cafe and enjoy a traditional Spanish breakfast of Bocadillos or Pan Con Tomate for $3 to $5. The options are vast and you can pick and choose what type of dining best suites you. Whatever you choose you can count on your taste buds being on sensory overload every day in Spain! $500 deposit payable directly online. Balance can be paid at your leisure. Final payment due June 30th. If you need a little extra time to pay your balance we are happy to help you out. Just send us an email and we will find a way to make it work for you! Please read our Terms and Conditions prior to booking.